Why are we the way we are? Why do some of us find it impossible to calm a hair-trigger temper or to shake chronic anxiety? 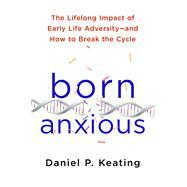 The debate has always been divided between nature and nurture, but as psychology professor Daniel Keating demonstrates in The Stress Gene, new science points to a third factor that allows us to inherit both the nature and the nurture of previous generations - with significant consequences. The Stress Gene introduces a new word into our lexicon: "methylated." It's short for "epigenetic methylation," and it offers insight into behaviors we have all observed but never understood - from the boss who goes ballistic at the slightest error to the sibling who is sure that everything you say is a hidden insult; from the infant who can't be calmed to the husband who can't fall asleep at night. In each case, because of an exposure to environmental adversity in utero or during the first year of life, a key stress system has been welded into the "on" position by the methylation process. The effect: lifelong, unrelenting stress and its side effects - from an inability to learn to an early death. An extreme stress response enabled our ancestors to survive in harsh climes, but in today's Western world, harsh environments tend to be low-income, high-crime areas. In an age of rising social inequality, the fate of ever-larger segments of the population may be debilitating stress - unless we take action to break the cycle.